We get too distracted by innocent things. The quick rush of a new toy, the ugliness of putting in the effort toward finishing some task, or just a lost sense of curiosity. All are healthy, human reactions to living in our distracted society. When we get too distracted by these short-term fancies rather than our long-term flights, that’s when we fall. Over the next few weeks, I’ll be addressing that forthright, starting with seemingly-innocent imagery. I define CIT as any singular event that must be completed in the short-term for self-improvement or group-improvement in the long-term. This is different than your most important task, or MIT, and any important, urgent, or non-urgent activities, or, queued important tasks: QIT. Every day has many QITs. For today, my CIT is writing the 500 words in this essay to fulfill today’s writing obligations. I can complete this before today’s MIT of seeing my dad this afternoon. We are so often distracted by new QITs jumping onto our plates that we forget out CITs, and due to fatigue, can often miss our MITs. 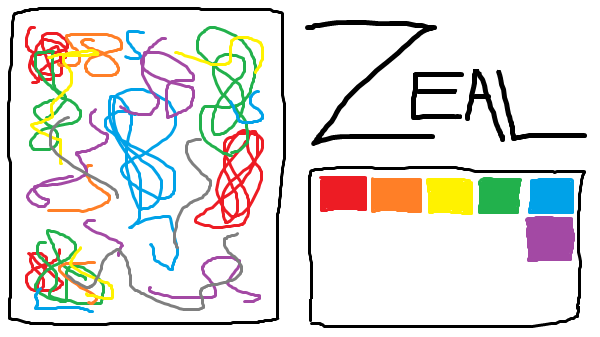 Each color represents some task. Left side: a mess of half-completed tasks. Right side: an organized set of tasks. When too many tasks pile upon one another, areas of space become cluttered with trash, represented here as gray. Ideally, we should have a sorting area on the left to prep the right. For that, we need simpler tasks. Let’s stop trying to make our MITs into these grand adventures involving a level of precision and concentration that not even a Rube Goldberg machine could achieve. If our CITs are too difficult, break them down or wrap them up quickly. It’s OK to let QITs sit for a moment while we wrap up our CIT. For the next few weeks, I’ll spend less time on the images. I won’t be taking elaborate photographs of minifigs standing in for drawings of John and Trishna from “The Story” and for the Sammohini Arc I might do something similar to what I did for my rowing column: a simple overlay image. This will free up time for me to concentrate on moving. If you’ve been attempting to follow my writings in a chronological order, sorry about that. I’ve been publishing my writing non-chronologically because my mind’s been addressing many QITs seemingly simultaneously, and I’ve been wanting to publish timely items sooner. Shaving off between 2 to 10 hours of preparation time for less important aspects of these tasks should help me address my higher-priority QITs first, which will then clear the way for lower-priority QITs. Example: cataloging my VHS collection and getting rid of the fluff will massively free up space. That discipline will help me next address my NES collection. Developing this focus now will help me with any task later. Sources: My professional experiences with prioritizing multiple urgent/non-urgent tasks and, I guess, my moving experiences? Professionally, I’ll address the most important tasks first, then queue up all the non-urgent tasks based on ease of completion. 5-minute win? Sure! 30-minute slog? Save that for now, break it down to easier parts, then plow through it! Inspirations: Realizing I’ve been wasting too much time on the visual elements of these essays, which, while important, isn’t my focus as a writer. Related: My Moving Zeal column.